Incredible late 19th or early 20th century rustic steer long horn chair and ottoman. 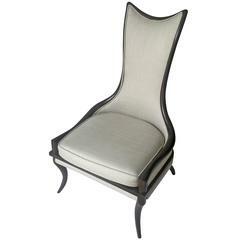 This chair is in great condition, has spring seat and is very sturdy. Older burnt orange velvet upholstery. 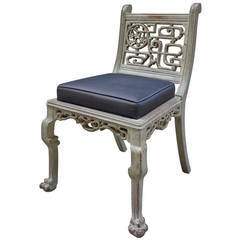 Chair rest on gilded claw and ball feet. 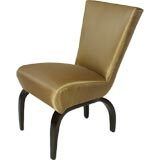 Ottoman has part of horn missing at base, horns on chair all excellent. Measures: Seat is 21" H Ottoman 18 1/2" W x 12 1/2" D x 9" H.
Slipper chair by Thonet with bentwood oak legs in dark brown finish. 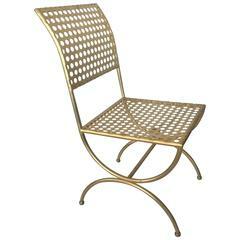 Perforated gilt iron chair designed by Tony Duquette in the 1960s, produced for Baker circa 2011. A large pair of late 19th century English armchairs in solid oak, of great proportions, having been reupholstered in neutral linen with studs. Measures: Floor to seat 49cm High. Late 19th century pair of French bergere chairs. Pair of carved side chairs from late 19th century.